Burnie the Little Devil Stuff! "Get'em while they're Hot!" 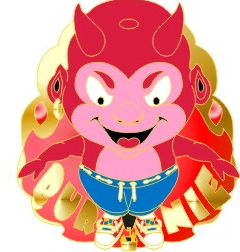 Here is the OFFICIAL 2006 Little Devil and Little Angel Combination Balloon Pin. This is a Limited Edition Pin. Supplies are limited. Only 12 Pins left!! Order Yours Now! Here is the 2006 Little Devil OFFICIAL CREW Balloon Pin. This is also a Limited Edition Pin. Only 300 pins were made! Supplies are limited! Order Yours Now! Here is the 2007 Little Devil OFFICIAL CREW Balloon Pin. This is also a Limited Edition Pin. Only 300 pins were made! And each is individually numbered! We kept Pins 1 through 10 for ourselves and the rest are in a bag and we will draw them out and you may get a low number also! We only sell pins on the website and in person or through our authorized reseller, Sam's Pin Shop in New Mexico. Supplies are limited! Order Yours Now! Here is the 2008 Little Devil OFFICIAL CREW Balloon Pin. This is also a Limited Edition Pin. Only 400 pins were made! We only sell pins on the website and in person or through our authorized reseller. Supplies are limited! Order Yours Now! Here is the 2009 Little Devil OFFICIAL CREW Balloon Pin. This is also a Limited Edition Pin. Only 200 pins were made! We only sell pins on the website and in person or through our authorized reseller. Supplies are limited! Order Yours Now! 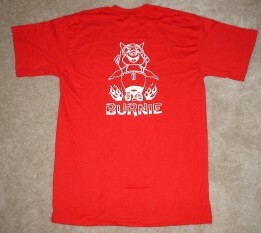 Here is the Official Burnie the Little Devil CREW Balloon Shirt. This is also a Limited Edition Shirt. Supplies are limited! Order Yours Now! 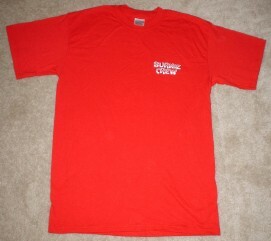 Sizes in Adult Medium - Large - X-Large Only! 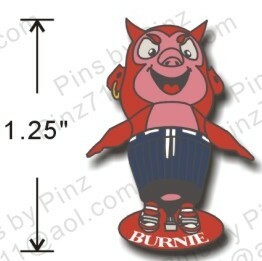 Here is the Burnie the Little Devil OFFICIAL Trading Card. Supplies are limited! Order Yours Now! This is the first card in the series! Only $1 for 2 cards. Please state whether you want the card signed by the pilot when you order. We accept Mastercard, Visa, Checks, Cash (US Currency) or PayPal.